Relational-database schema comparison and merging is a well-established market. Leading products include SSDT Schema Compare and Redgate SQL Compare, which is partially integrated into Visual Studio. These tools are used by organizations seeking to adopt a DevOps culture to automate build-and-deployment processes and increase the reliability and repeatability of mission critical systems. Comparison and merging of BI models also introduces opportunities to bridge the gap between self-service and IT-owned “corporate BI”. This helps organizations seeking to adopt a “bi-modal BI” strategy to mitigate the risk of competing IT-owned and business-owned models offering redundant solutions with conflicting definitions. Such functionality is available for Analysis Services tabular models. Please see the Model Comparison and Merging for Analysis Services whitepaper for detailed usage scenarios, instructions and workflows. This is made possible using PBIX import in the Azure Analysis Services web designer (see this post for more information) and BISM Normalizer, which we are pleased to announce now resides on the Analysis Services Git repo. BISM Normalizer is a popular open-source tool that works with Azure Analysis Services and SQL Server Analysis Services. All tabular model objects and compatibility levels, including the new 1400 compatibility level, are supported. 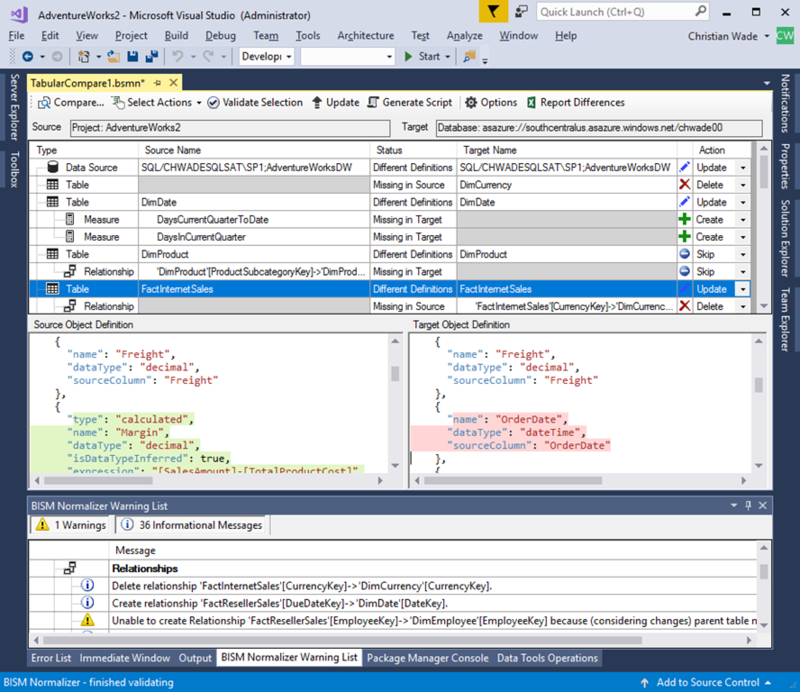 As a Visual Studio extension, it is tightly integrated with source control systems, build and deployment processes, and model management workflows. Thanks to Javier Guillen (Blue Granite), Chris Webb (Crossjoin Consulting), Marco Russo (SQLBI), Chris Woolderink (Tabular) and Bill Anton (Opifex Solutions) for their contributions to the whitepaper.